Tessellation. 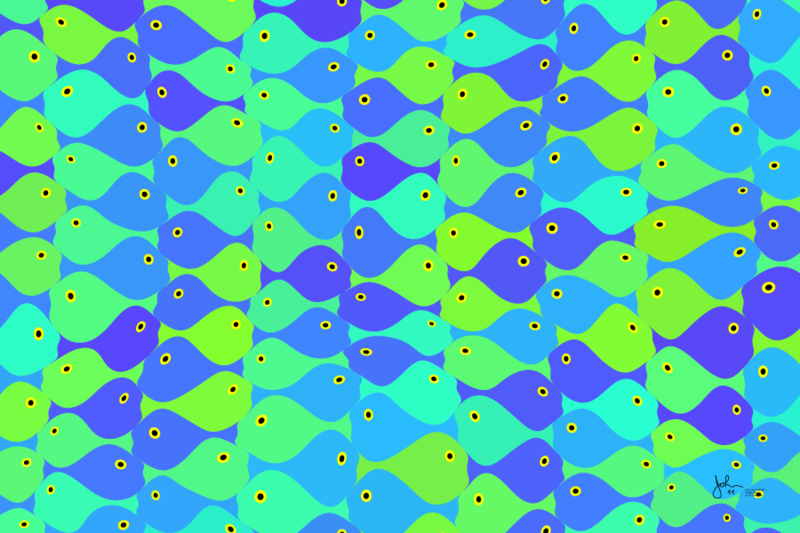 Tiled fish with the blue-green colors of the sea. Each fish seems to have its mouth open trying to devour the tail of the fish in front. It is interesting that one can color this image with just two colors. Blue fish only touch other blue fish at a single isolated point, etc. This image differs from bigpic 310 in that the fish are distorted. They still all fit perfectly but each one has an individual shape and color. This creates an illusion of "swimming". It is a curious fact that all of the boundaries were constructed with 3 sine waves. I started with sine waves in my first trial, simply because they are easy to implement. I liked them, and they are still here.